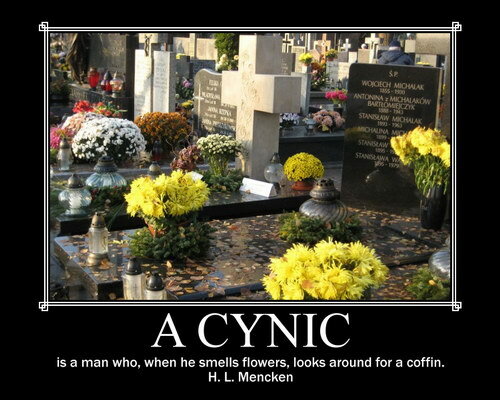 There are many people who perceive word “cynic” like a compliment. Cynicism became an integral part of our life quiet recently. Let’s take, for example, such “institute” as a family and marriage. The cynic marries because it’s very convenient, with understanding of that “I’ll have to do it one day…”. Wife for him is an undeniable convenience in comparison with bachelor’s life. She is – the ironed shirts, the made breakfasts and the clean house. Unfortunately, the cynic won’t be able to appreciate it all because he can’t be grateful. The cynic believes neither a destiny nor a unity, but he’ll always believe in compatibility and in coexistence. He doesn’t love his wife because he’ll never believe that she may love him. So, let’s remember Oscar Wilde’s words: “The cynic knows the price of everything and the value of nothing”.